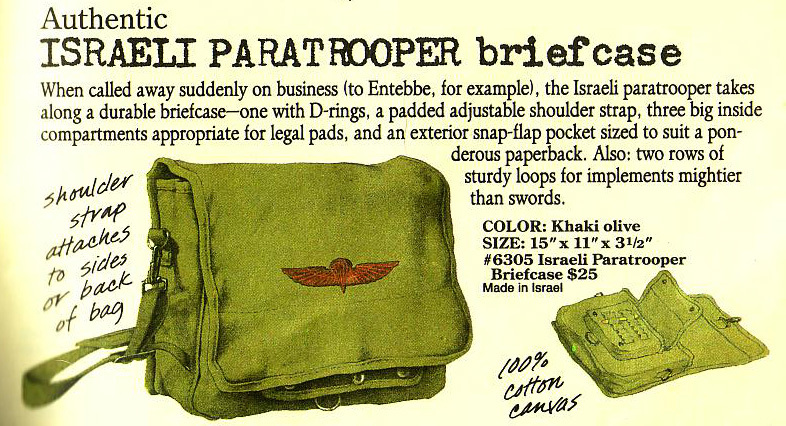 When called away suddenly on business (to Entebbe, for example), the Israeli paratrooper takes along a durable briefcase — one with D-rings, a padded adjustable shoulder strap, three big inside compartments appropriate for legal pads, and an exterior snap-flap pocket sized to suit a ponderous paperback. Also: two rows of sturdy loops for implements mightier than swords. I got one of these at an army surplus store for about $10. This is more of a request than a comment post. You have talked about how you manage your extensive library of mp3 files using iTunes. I have over 1000 mp3 files in my library, which I manage nicely with iTunes (I have a 4gb nano). I also have an extensive library (about 2500) of videos from YouTube, MySpace, Yahoo!. Red Balcony, my DVR, and other sources which are in a format that iTunes does not recognize. It would be so great if I could somehow manage these videos in iTunes. Do you know how to do this? Maybe you could do a writeup on this in your blog. That would be nice. I have the original paratrooper bag too, that I think I got in 87 or 88. I began using it again this month when I returned to college as a 39 year old! LOL! I happened upon your site tonight when I was trying to explain my bag to a friend in Jersey! I can’t believe our cool original bags are now over 20 years old!! I had one of these, too and it was stolen! The $15 knockoffs available at the army surplus places are definitely not as cool. Would love to find the real deal! I am almost positive that Banana Republic still sells them!! Your right they do not make the origianal anymore. I to had one and lost it along the way and have been searching for a replacement since. I purchased one of these for my daughter 23 years ago, in 1986. She loved it and carried it every day. When she left for college, her younger brother asked if he could have it. He, in turn used it until he died three years ago. A well loved and used bag, that I’d like to pass on to my grand daughter. I, however, would love to buy an authentic one but the knock off version sold at the army navy store is but a cheap version of the sturdy original. Where can I find the real thing?? I had one of these in high school/college. It was indestructible and held all my stuff very nicely. I miss that bag. Thanks for sharing this! My briefcase is long gone but I still have the matching duffle bag. I used it as luggage back in the 80’s. I got my bag when they first came out from Banana Republic then bought another one. I asked my freind who went to Israel if she could get me one because they(Banana Repulic) ran out and wanted an third one in case my other two got messed up but she could not find any. But now my bag is all mesed up both of them so I am looking for a replacement. Inside the flap it had a stamp that read MADE IN ISRAEL so you knew it was real and not made in china or a cheap knock off. The original bags were a light olive green and if left in the sun a while would fade out. I dont recall any black ones or dark olive green ones. I don’t know when the Israel to China manufacturing took place, but I got my paratrooper back in 2004 and it’s treated me very well ever since, it’s been all across the US and Japan lugging along my often overweight burdens(I use this as a college student, if that gives you any idea). I’d recommend these guys, I’m about to buy another one for my art class(keep those things separate…)! I also have one of these I purchased from the BR catalog in the Spring of 1986. I was working in unit marketing for Wendys International at the time and spent most of my time in the stores visiting with the managers. I needed something that could be washed because the smell of the fryer oil just permeated everything. I got a lot of use out of that thing, and still have it hanging on a peg in my garage, although I haven’t actually used it for anything in probably 25 years. I have an original Israeli Paratrooper bag-Dark olive heavy canvas-Stamp inside “Made in Israel-100% cotton” Real red logo on front. Gift from an Israeli friend who is a Captain in the IDF. Get lots of comments! I received one of these bags as a gift from my sister for my 15th birthday in 1985. 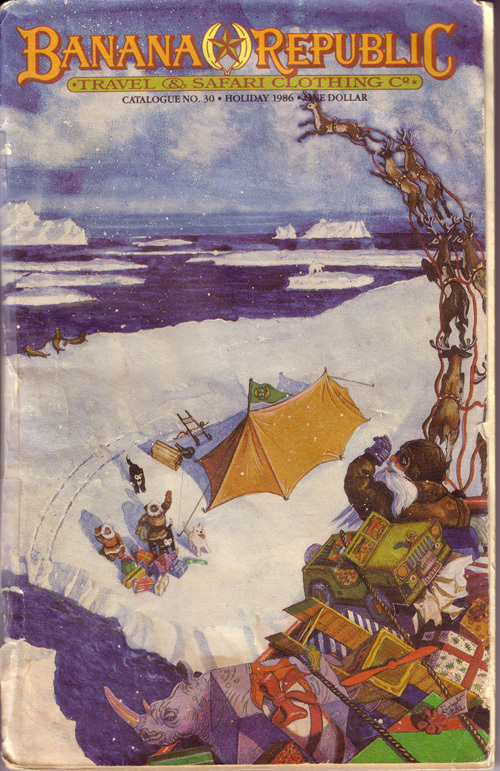 I used to love these catalogs and the store that was in Water Tower Place in Chicago. I’m looking for a strap for mine now as mine is beyond saving.